Try using the SMEDG search engine! Top right...be amazed! SMEDG holds monthly meetings, free and open to anyone interested in mineral exploration and related topics. Attendance is usually about 40, occasionally 80 -100. SMEDG is a not-for-profit organisation, run by a volunteer committee and funded by the proceeds of its biennial Symposia and Mines and Wines. Funding of events is as close to 'at-cost' as we can make it, with sufficient left over to pay for 10 meetings per year at '99-on-York', and to underwrite the next Symposium. 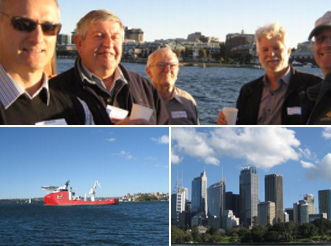 SMEDG, with massive input from David Timms, organises two Sydney Harbour Cruises each year. This web site was originally created, by Steve Collins in July 1999, to provide news of meetings for the SMEDG community. It has evolved, somewhat haphazardly, into an information resource with hundreds of extended abstracts and papers, many with .ppt/.pdf files attached. The globe is interactive: enlarge or rotate. See yourself flagged on SMEDG. Red dots show visitors' locations.